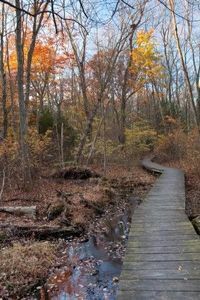 Fairfield, CT - The Connecticut Audubon Society Center at Fairfield, 2325 Burr Street, will offer Nature Nursery Spring Classes on Wednesdays March 27 through May 8 (no class April 17), from 10 – 10:45 a.m.
Young children discover the wonders of their natural surroundings at the Nature Nursery classes offered by The Connecticut Audubon Society’s Center at Fairfield. Classes meet Wednesdays, March 27 through May 8 (no class April 17), from 10–10:45 a.m., at the Center at Fairfield, 2325 Burr Street in Fairfield. The weekly program, with outside adventure and inside fun, shows it’s never too early to start building a connection to nature. Classes are for ages 2 to 3, accompanied by a participating adult. Activities include stories, crafts, games, experiments, live animal visits and outdoor exploration. Single program fee: CAS members $15/class; non-members $20/class. Advance registration is necessary; sign up for the series or individual classes at: www.ctaudubon.org/fairfield-programs-events/. For more information, call: 203-259-6305, ext. 109.